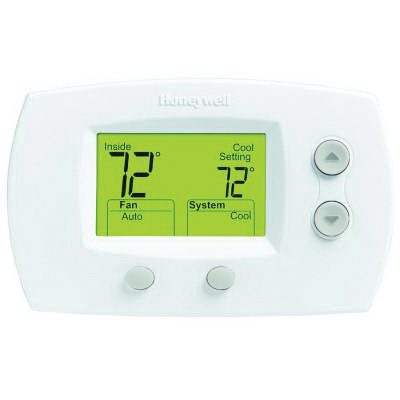 Honeywell FocusPRO® 5000 Non-programmable digital thermostat with two heat/two cool stages, offers precise comfort control (+/-deg F) that maintains consistent comfort. It has voltage rating from 20 to 30-Volts AC, current rating from 0.02 to 1-Amp and power rating from 0.4 to 30-Watts. The dual-powered thermostat with thermistor sensor, has relay switching. It is suitable for 2 heat/2 cool conventional systems and 2 heat/1 cool heat pumps.